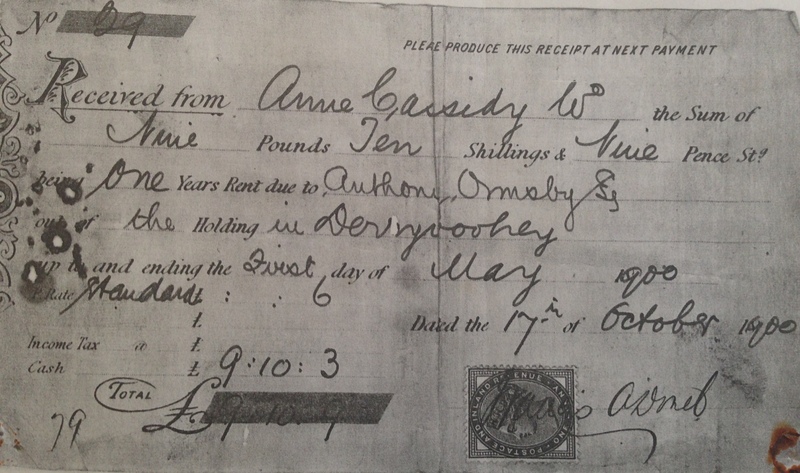 May 1st, 1900: Receipt for payment to Anthony Ormsby by Anne Cassidy for one year’s rent. We’ve been looking at the Ormsby family who owned the estate at Ballinamore House as part of our primary sources research. Anthony Ormsby is known locally to this day as “Black Anthony” and is not considered to have been a benevolent Landlord! We have found their records for the 1901 and 1911 censuses. We know that Anthony is deceased at this time (d.1892) and his wife is listed as a “widow”. Her job description is “Lady”. The census records Anthony Ormsby as the landowner in 1911. It is not clear why this is, he is deceased nearly 20 years at this stage. We think it may be something to do with lack of succession rights for women. The photograph above is a reproduction of an original receipt for one year’s rent paid by Anne Cassidy of Derryvohey for the sum of £9:10:3 in 1900 to Anthony Ormsby. Again, the rent here is payable to a dead man! We found Anne Cassidy’s 1901 census entry , she is listed as the “landholder”. We know she doesn’t own the land as she is paying rent, so we are concluding that there must be a difference between “landholder” and “landowner” (the “owner” of the land is not listed in the returns. Incidentally, she is also listed as “landholder” for another house occupied by the local school principal, Dominic Doherty. We have discovered via The James Hardiman Library in NUIG that Anthony Ormsby owned 4,492 acres in 1876. There is further information on the Ormsby family and Ballinamore Estate on NUIG’s website. If anybody out there can give us more information we’d love to hear from you!